Summer seems to have finally arrived where we live, and my kids are spending a lot more time outside, playing and being noisy and getting dirty. It's great. Whether we're at home or traveling, I love spending time outside with my kids, and I know they love it too. 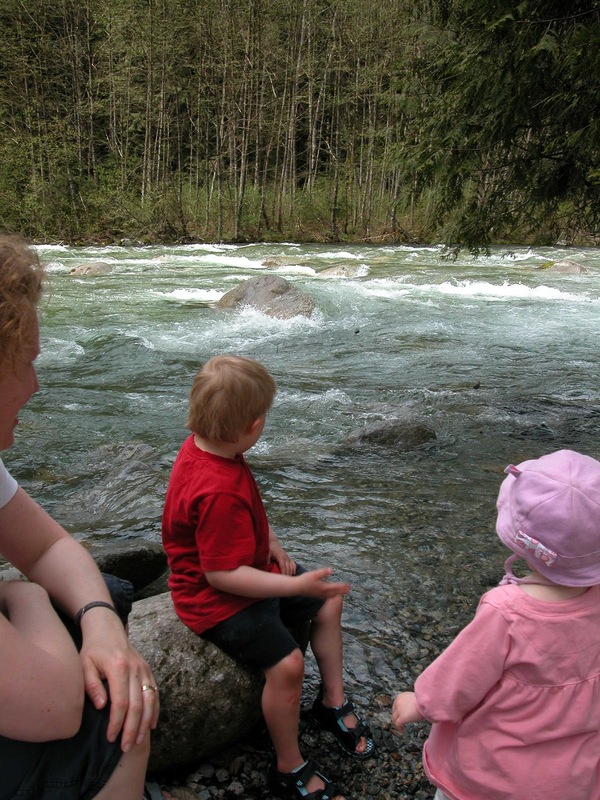 Many of my family's weekend activities are outdoor activities, such as going for a hike in the woods or a walk around Stanley Park's Sea Wall, or just hanging out at a playground or the beach. All pretty simple and cheap stuff that doesn't require a lot of planning or special equipment. This is very true for my own children. If they're inside playing or watching TV for long periods of time, they always seem to get antsy and irritable (or maybe it's me that gets antsy and irritable... hmmm...). However, if I bring them outside for even something simple like a walk or jaunt to a nearby playground, their mood improves. For my son, who has some special needs, I notice this effect even more strongly than in my daughter. He absolutely loves the outdoors, and is never happier or calmer than when he's hiking in the forest. Maybe part of it is that you can move around more freely outside, you can be a little louder (outdoor voices), and then there's all that excitement with a whole world to explore with all your senses. Dressed for the weather, Swedish style. Personally, I think that being outside is usually healthier because you move around more (exercise! ), and you get some sunshine to boost our immune system and vitamin D.
Dressing for the weather is important of course, but I find that as long as I do that, my kids can have a blast outside even if it's raining. And hey, if it's snowing we can really have some fun! I'm a big believer in the mental and physical benefits of unstructured playtime. Sure, more educational types of activities are great for kids too (doing alphabet games, writing, colouring inside the lines, and so on). But still, I think that playing outside with the things that are outside: dirt, water, sand, rocks, sticks, bugs (eek), plants and so on really stimulates a child's mind in a totally different way than any toy or activity book can do. Watching my kids dig for worms, water plants, run over plants with their wagon, make up games to play when they're running around or jumping on the trampoline, climb and balance on logs, dig in the sand, throw rocks in the ocean... these are moments when they are totally absorbed by the world and what they can do in the world. There's lots to read online about ideas, studies and theories on the mental and physical benefits of outdoor play, including Starfish therapies, and Making the most of outdoor time with preschool children. ...people who have had frequent childhood experiences in natural spaces are more likely to visit such places as adults. Also people who have had frequent childhood experiences in natural places tend to feel more comfortable visiting these places alone, and have a more positive attitude towards these spaces as adults (e.g. they feel more energetic and restored in these spaces). Simple, right? If you like to be outside, then you will probably pass that on to your kids. I sure hope I'm passing it on to mine! Maybe when we're walking in the woods or on the shore, talking to them about the trees and the plants and the moss and the fungus growing on the tree stumps, listening to the birds, looking for squirrels and other animals, and wondering together about just what kind of animal tore apart a rotten log. I've described my most relaxing place in the world before on this blog: the beach. Nothing beats it for complete relaxation with my kids. At least now that they're old enough not to eat sand (so much), or try to drown themselves in shallow waters. I find that time spent outside with my kids is usually more restful. This past weekend we lay on an old mattress on the lawn and looked at birds and airplanes. Essentially we did nothing, and it was great. I find that those enjoyable doing-nothing-at-all moments with my kids are something I just don't value enough.